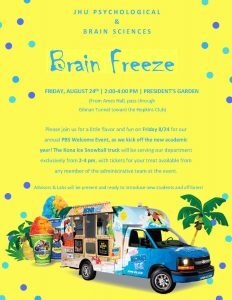 Please join us from 2-4 p.m. on Friday, August 24 at the President’s Garden for a little flavor and fun at our annual PBS Welcome event, as we kick off the new academic year. Advisors and labs will be present to introduce new students and affiliates. The Kona Ice Snowball truck will be serving our department exclusively.